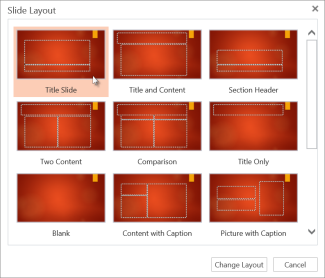 PowerPoint comes with “themes,” sets of professionally designed colors and layouts. Just pick a theme, and all your slides will follow that look. Every theme has variations, so you can pick a different color scheme. Each slide layout has placeholders for text, pictures, charts, shapes, and more. Pick the layout that works best with the content you plan to present. On the Home tab, click Layout. Pick a layout, and click Change layout. For text bullets, place your cursor in the line of text, and on the Home tab, pick a bullet style. In the Choose File to Upload box, find a picture, and click Open. For smooth, animated shifts between slides, add transitions. On the Transitions tab, pick a transition. To apply the transition to all the slides in your presentation, click Apply To All. You can run your PowerPoint Online presentation with an Internet connection and a web browser. To start your slide show, on the View tab, in the Start Slide Show group, select From Beginning. Click Exit to get out of Slide Show View. 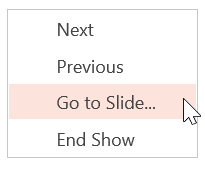 To go to any slide in the presentation, right-click the slide, and click Go to Slide. Enter the slide number in the Slide box. 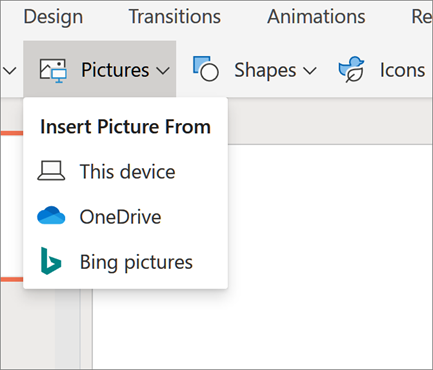 As you work on your presentation in OneDrive, you might want to share it so other people can see it or work on it with you. 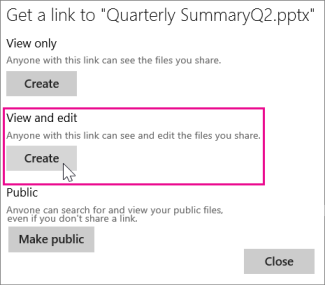 To share a view-only copy of your presentation, under View only, click Create. To let others view and edit a copy of your presentation, under View and Edit, click Create. 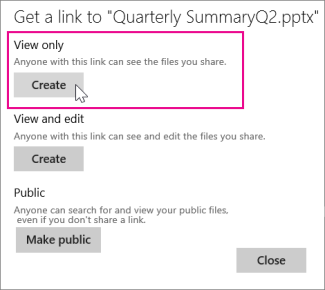 To shorten the link you share with others, click Shorten. Copy the link, and click Close. Paste the URL into an email, chat session, or social networking site. You can print your slides and use them as handouts, or you can add your speaker notes to them and use them as a visual aid when you present. 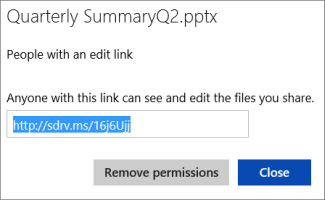 Important: A PDF viewer is required for printing in PowerPoint Online. If you don't already have one, you may be able to download one from the Web. To see the presentation when it’s been converted to PDF, click Click here to view the PDF of your document. 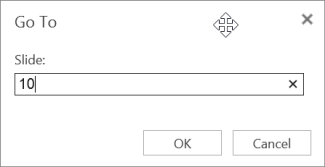 In the Print box that appears, under Page Sizing & Handling, click Fit, and under Orientation, click Landscape. Set any other print layout options you want. Note: If you need help picking print options, click the Help link in the upper right corner of the Print box.